When you're looking to purchase the perfect home, you'll want to consider not just the property but the neighborhood too. A bad home location can change a perfect house into a money-losing nightmare. Crime, construction and environmental changes can all have an impact on the future value of your dream home. Here are the top five things to consider when shopping for a new house. New road construction or upcoming projects can be a good thing if they're an improvement. But if they lead to nearby property changes or substantial alterations to the neighborhood traffic patterns it can drop the value of all the homes around. Check with the town to find out any projects that are in the planning phase. Whether your concerns are hurricanes or changing global climate, a home in danger of flood is at risk of significant devalue. 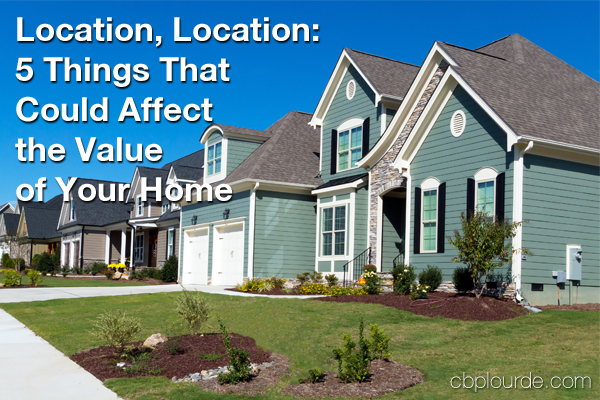 A quick search should determine the overall risk for your location. When looking at potential homes, look for signs of previous flooding such as water stains, rot, mold or even standing water. A top deciding factor in many peoples' home buying decisions is how well the school district scores. But even if the house your looking at scores favorably, you'll want to make certain there aren't any redistricting plans in the works as they could affect how it scores in the future. Nothing drives down the value of property like a neighborhood on the decline. Excessive graffiti and gang signs can be indicators that criminal activity is on the rise in the area. There may be other markers, such as reinforced doors and gates or posted neighborhood watch signs. Conflicts in personality are hard to predict: one person's nuisance neighbor is another's quick friend. But generally speaking, if your new home is located next to a known party house, you're probably not going to be happy there for very long. Check police log archives for history of noise or other complaints in the neighborhood. Coldwell Banker Plourde can help you not only find your dream home, but do the research to make sure it is located in the perfect neighborhood as well. Contact us today. To view all of our blog posts - click here. The process of buying each new home may differ on the details, but there are several major milestones you can anticipate every time, such as the first showing, the offer, the home inspection and the loan arrangements. Each milestone passed brings you that much closer to the finish line called home ownership. But before you make that final sprint for the closing, make sure you clear one of the most important milestones: The final walkthrough. 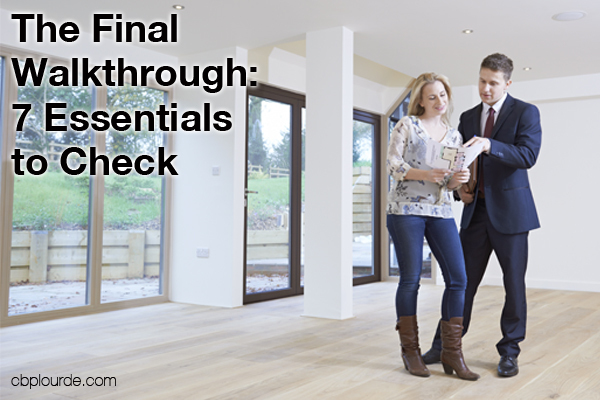 The final walkthrough is your last chance to inspect the home and exterior property before they - and any problems they contain - become yours. This is when you’ll want to check for the completion of agreed-upon repairs, any changes made since the initial home inspection, and signs of new damage or destruction. Flush all toilets. Turn on all faucets, including hot water, and run for at least a minute. Run the shower, fill the tub with an inch or so of water, and let it drain. Don’t forget washer hookups and outside spigots as well. Look for signs of plumbing problems that may have been previously missed or developed since the home inspection (especially if the home has been vacated). Check the basement, walls and ceilings for any signs of wetness. Water can come from a leaky pipe or roof, so look carefully. Check under the sinks and behind toilets. The best method is to keep the lights dim and use a flashlight, as water will reflect the light. Turn on every light switch. If a light doesn’t work, make a note to find out why. It’s usually just a burned-out bulb, but it could also be a sign of faulty wiring. Activate the heat and air conditioning, in turn, and make sure they work properly. Make sure the service tags are marked, or that you know when they were last serviced. Check that the oven and all range burners turn on. Make sure the refrigerator and freezer(s) are cold. Doors and windows should open freely and latch securely. You should have, or know the location of, storm doors or screens. Make sure all doors lock and unlock easily. Inspect the frame around each one, especially in a home that is vacant, for signs of break-ins. Signs of pests can vary, but some of the more obvious ones include rodent droppings in cupboards and under sinks, freshly dug holes around the house and sawdust from chewing insects in out-of-the-way places. Old cans of paint can be a pain to dispose of, so most homeowners leave them behind when they sell the house. The same is true of old building materials. The seller may think they’re doing the buyer a favor by leaving behind all those scraps of plywood, but if you don’t want them, you’re the one who is going to get stuck paying for their disposal. The final walkthrough is a very important step of the buying process and one that the buyer should not do in a hurry. 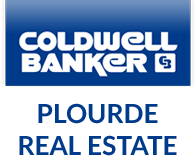 Coldwell Banker Plourde Real Estate will help guide you through the entire buying process, including the final walkthrough, so you’re not left with last-minute surprises. Contact us today. To view all of our blog posts - click here. RonalsTat on Life As A Realtor...Over Glorified or Not?